“You're fired!” Grouchy news publisher Hal Morris sends reporter Melanie Perkins packing for taking too many photos of flowers. Panicked at being unemployed, she lands a job as a landscaper, but an ugly surprise greets her on her first day. A pile of mulch, a tangerine, and a stolen hoe cast suspicion on Melanie. Melanie’s efforts to find a murderer instead put a target on her back. Some of the aim is coming from law enforcement, but they aren’t the ones who want to silence her permanently. Life along the Des Moines River in Iowa can be peaceful, but a murderer has no problem disturbing her tranquility. 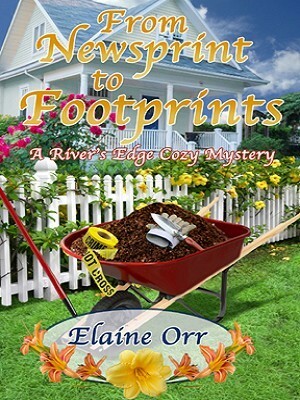 In this, the first novel in beloved cozy mystery writer Elaine Orr's new River's Edge series, the author once again offers humor, believable characters and tight prose as she carries the reader to an exciting climax. Those who follow her Jolie Gentil series will find themselves right at home.